It's been quite a while since I shared any recipes (sorry) but for a few months now, my bestie has made the most delicious dip, at our gatherings. She found the recipe on Our Best Bites, a website by 2 very talented ladies, Kate and Sara. They have the most delicious recipes and it's become one of our favorite recipe "go to" sites. 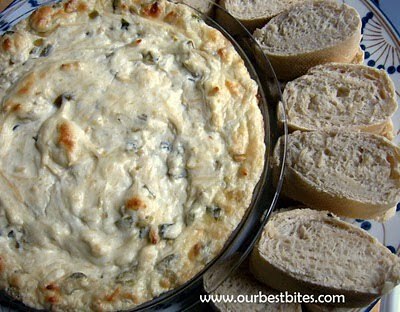 You have to try this Jalapeno Popper dip, it's incredible! If you know me, you know that I am NOT a fan of jalapeno poppers AT ALL. My poor hubby loves them but I won't make them because they gross me out, lol. But since my friend started making it, I have fallen in love and so has my hubby. And since I can't very well have my friend make it for us, whenever we crave it, I've had to make it as well. It's not the prettiest dish but oh my god, how the taste will totally win you over. *1/2 can is mild with a little bite, a whole can is definitely on the spicy side, but if you've got taste buds of steel, you might prefer a 7-oz. can. 4 ounces definitely pushes the limit for my husband and I and our kids won't touch it. Preheat oven to 350. In a medium bowl, combine the ingredients and spread into a 9" pie plate or a small baking dish. Bake for 20-25 minutes or until dip is bubbly and golden brown. 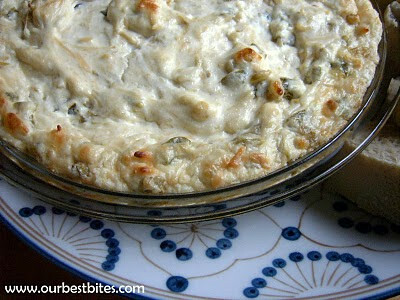 Thanks for following me at www.havingfunsaving.blogspot.com - My hubby and I are HUGE Jalapeno Popper Fans! Yum....I am going to post this on my site too - with a link back to you! YUM! Thanks for sharing! i love creamy recipes like this! 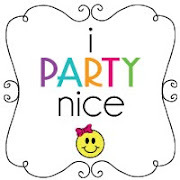 Thanks for stopping by my blog and happy end of the week!